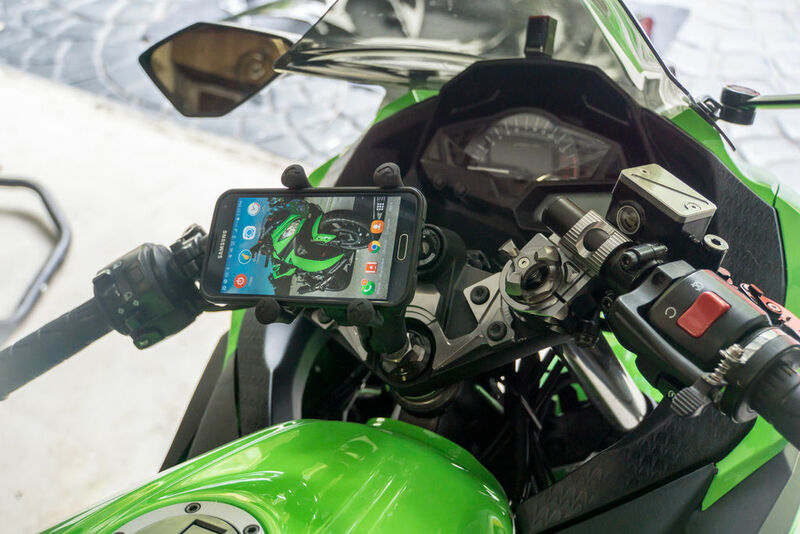 This is how the finished Ninja 300 phone mount looks. A nicely centered, versatile, secure smartphone mount. This is just one of the upgrades I’ve done to this bike. 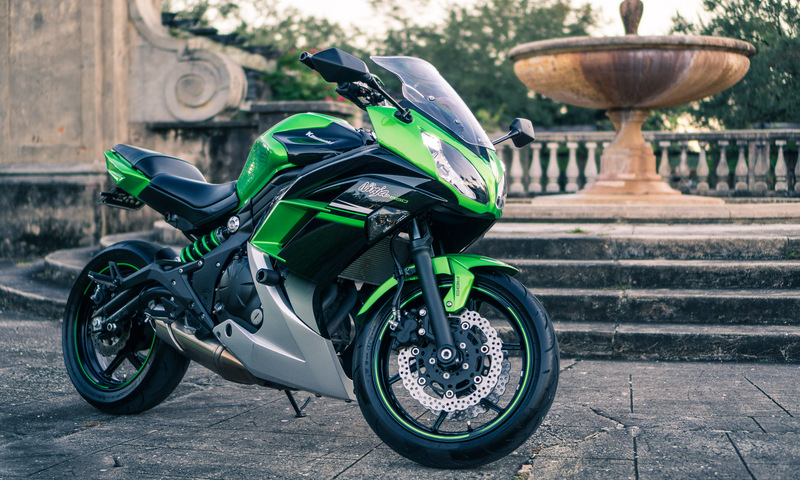 If you want to see other interesting parts I’ve installed, check out my Ninja 300 Mods list. In it, there are plenty of upgrades and accessories I’ve tested out that help make this awesome bike even better. Most are “bolt-on” and take just minutes to fit to the N300. Given that we will be tapping a shallow, blind hole, we need a complete tap set like this, which includes a bottoming tap. Ram Mount 1-Inch Ball with 1/4-Inch 20 Male Threaded Post – This is the standard ball for most Ram Mount attachments. It’s the main item needed for this Ninja 300 phone mount. If you need a cheap phone mount for it, consider this budget X-grip smartphone holder/charger. OEM or Aftermarket Steering Stem Bolt – This is what we’ll be threading for the Ram Mount post. 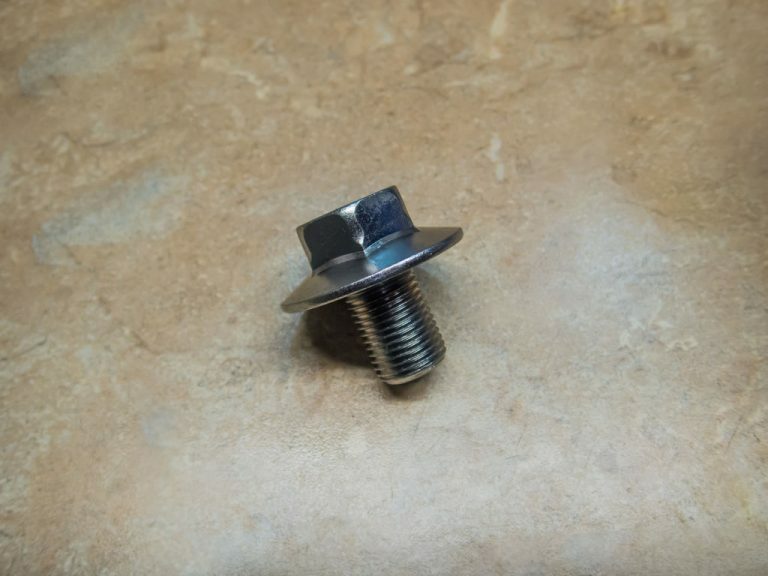 You can use the OEM Steering Stem Bolt, or do it to an aftermarket bolt like the one above if you don’t want to risk the original part. 1/4-20 Tap Set – We will need all three tap types for this job (Taper, Bottoming and Plug). 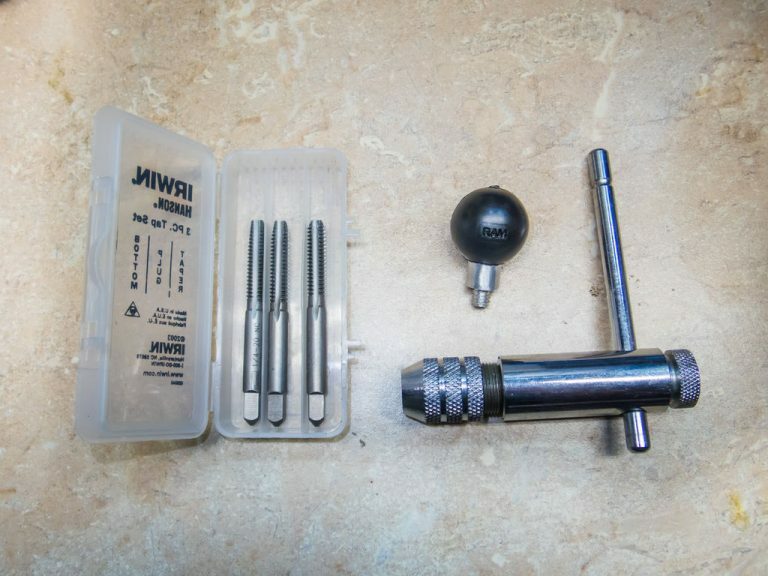 Tap Wrench – I personally prefer the ratcheting variety since it’s quicker. You should use whatever you have at hand. 13/64″ or 3/16″ or 5mm Drill Bit – These are the suitable drill sizes for a 1/4-20 thread, erring towards a tighter fit. 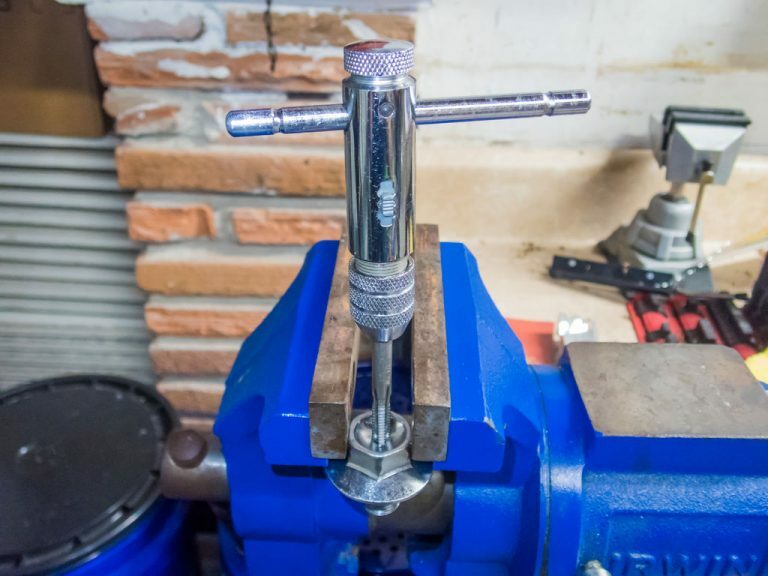 Center Punch – To keep the drill bit from slipping. Red Threadlocker – For this use, high-strength red threadlocker is preferable to blue threadlocker. Tape – To mark the drill depth. 22mm Socket – To remove the steering stem bolt. It’s not exactly a standard sized, so before assuming your socket set already has one, check first. This is the original Steering Stem Bolt on the Kawasaki Ninja 300. The first step is to remove the Steering Stem Bolt. It’s a large hex bolt, so you’ll need either a wrench or a 22mm socket – preferably the latter to avoid rounding the bolt. Put it in a vice so we can work with it properly. Don’t grab it too hard to avoid deforming the threads. And preferably, put it in some v-jaws for cylindrical parts like above so it doesn’t slide. Align the ruler with the hex corners to draw lines crossing the center. Use a Center Punch or metal scribe to mark the lines. Once you’re satisfied, center punch the center where the lines align. Now we want to mark the center of the steering stem bolt. Use a ruler aligned with the hex corners to mark along the center of the bolt with the Center Punch‘s sharp tip. Make two or three lines to find the center, and then center punch it. Any small drill bit will do to make the pilot hole. Since the bolt head is concave, the bit will tend to self center, which is why I secured the drill bit so far out. Though we will still need to be careful so the pilot hole ends up in the center, which is why the center punch mark is important. And this is the pilot hole. 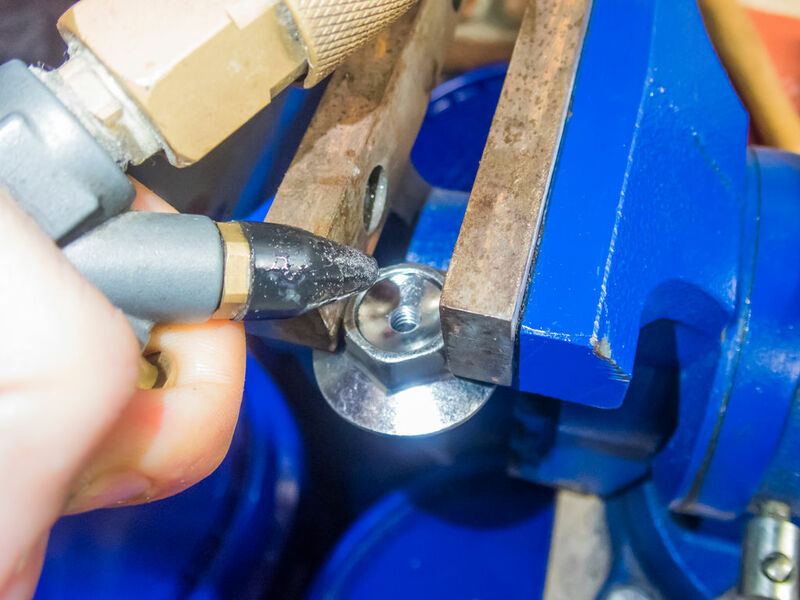 Given how important getting the center right is, we will be drilling a pilot hole first to guide the main drill bit. I was going to do this in the drill press, but I decided to go with a hand drill instead since that is what most people reading this would be using. Any small drill bit is fine. 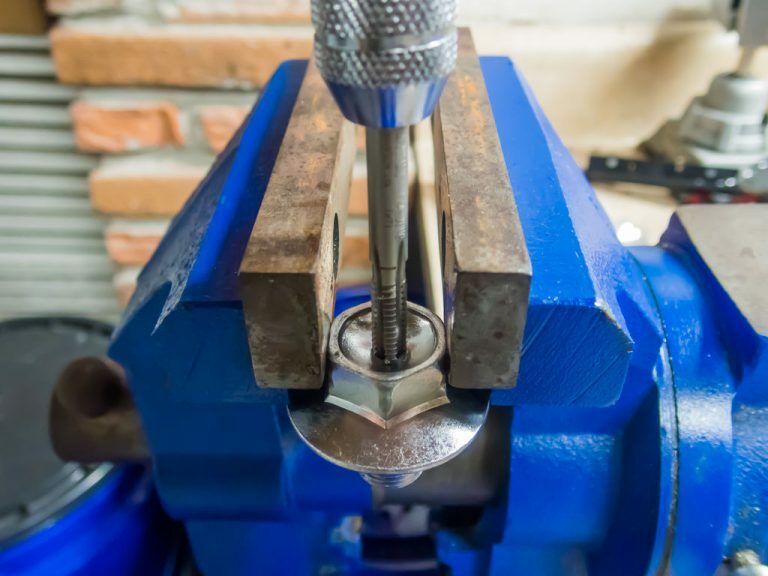 Since the bolt head is concave, the drill bit will naturally tend to center itself. Don’t drill too deep. About a centimeter or less is as far as you need to drill. To give the thread some play, I drilled about as twice as deep as the short thread, but that’s as deep as you’d want to go. The tape will let me know when I’ve reached the right depth. 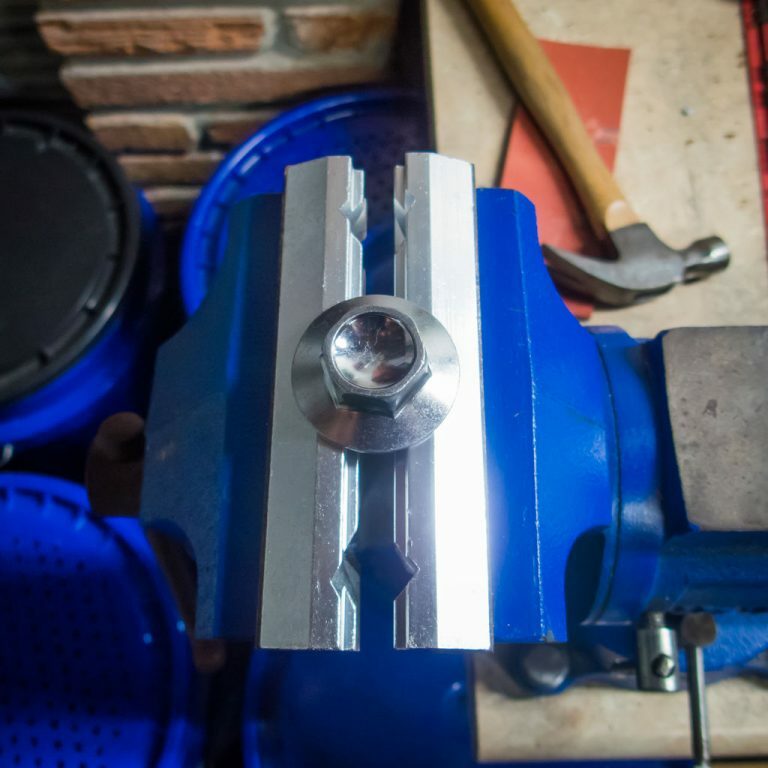 And this is our nicely centered hole, ready for tapping. To correctly use the tap, we need to make a hole slightly smaller than the threads. The correct drill bit for a 1/4-20 thread is 13/64″, but since I wanted an extra tight thread I went with a 5mm drill bit. I used a piece of tape to mark how deep I wanted the hole. Any unnecessary material removed is simply weakening the bolt, so we should make the hole only as shallow as needed. The bolt is steel, so use a slow speed and a lot of pressure. You know you’re drilling at the right RPMs and pressure when you’re getting a thin, long metal spiral instead of splinter-like chips. Add some lube to make the tap’s job easier. To help the tap make the hole easier, add some lube. Any lube. 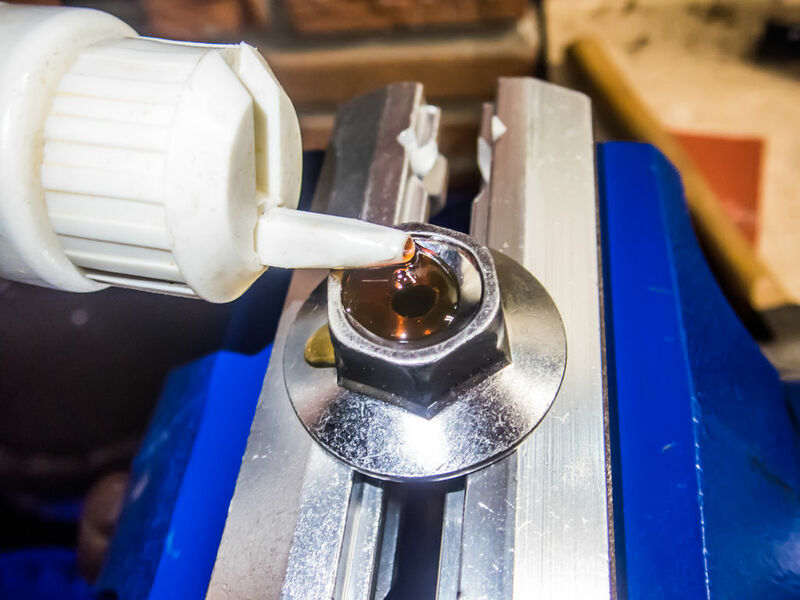 Tapping Oil made specifically for the job is best, but hardly necessary. Even used motor oil will do. Go slow, and reverse wherever the tap binds up. First use the most tapered tap and go slowly. When the tap binds, go back a rotation and then continue forward again. It is extremely important to make sure the tap is straight. Keep tapping until the tap can’t go forward anymore. Blow out any chips that might be stuck at the bottom of the hole every time you remove the tap. Since the hole is blind, we’ll have to blow out the chips so they don’t keep the tap from reaching the bottom. Engage your safety squints and blow the chips out. After the taper tap has been used, try the plug tap. Once we can’t proceed any further with the taper tap, use the Plug Tap. Just repeat the same steps as before. 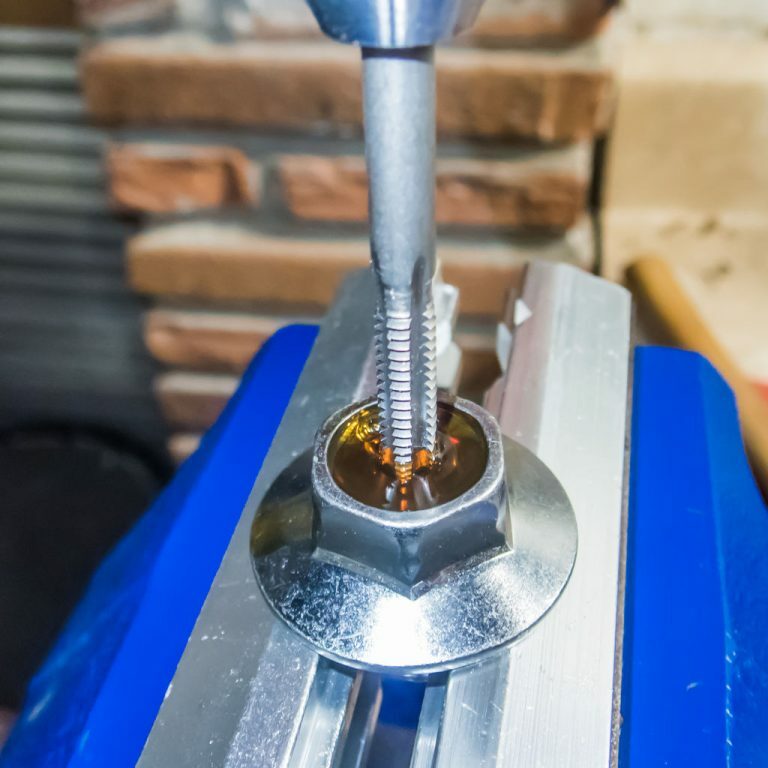 I moved the bolt to the bottom side of the vise to grip the head and avoid the bolt slipping or damaging the threads under the pressure of the vise’s jaws. Now it’s finally the Bottoming Tap’s turn. With this tap you’ll be able to just almost thread the hole until the bottom. Make sure to blow out the hole before concluding you can’t tap any further. And there’s our nicely tapped hole. Perfect! Now we have a tapped hole where we can thread the Ram Mount Post. Let’s proceed to installing it. To install the steering stem bolt again, we only have to screw it back on. The correct torque for the Steering Stem Bolt is 44 N·m / 2.0 kgf·m / 32 ft·lb, which is “pretty tight, but don’t over-do it”. Just set the right value on your torque wrench. No threadlocker is recommended per the manual. Once the Steering Stem Bolt is properly torqued down, it’s time to assemble the Ninja 300 phone mount. We need to screw in the Ram Mount Ball. Ideally, red threadlocker should be used if you won’t be removing the steering stem bolt in the near future. If not, blue threadlocker is also an option if you already have it at hand, but be aware that the ball might come loose sooner rather than later. This is how the finished product will look. A nicely centered, versatile, secure Smartphone mount. Make sure what you get includes an extension like this one, or just remember to purchase it separately. There we go. A nice, OEM-looking Ninja 300 phone mount. And there we go, your Ninja 300 phone mount is done! Now we just need the right attachment for it. 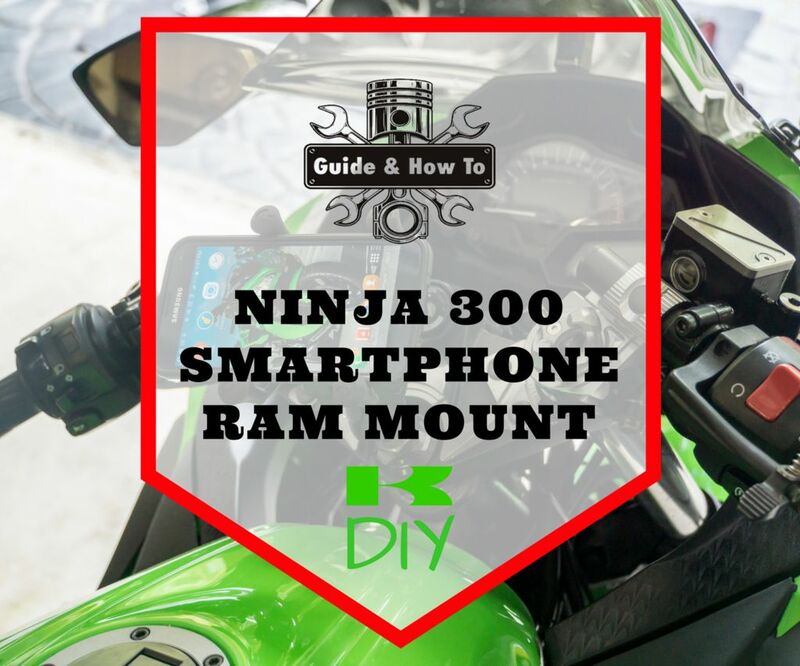 Ram Mount is a system so you’ll have to choose what components you like best – Check my other Motorcycle smartphone mount DIY for more info on that. The most universal option is Ram Mount’s X-Grip Phone Holder. If you want a cheaper clone with an integrated charger, consider this phone holder/charger instead.